Falling along the same lines of the 2015 edition in Trieste and of the 2017 edition in Bologna, the event aims to provide the concepts and basic physical principles of scanning electron microscopy and microanalysis with a special focus on materials and related applications. 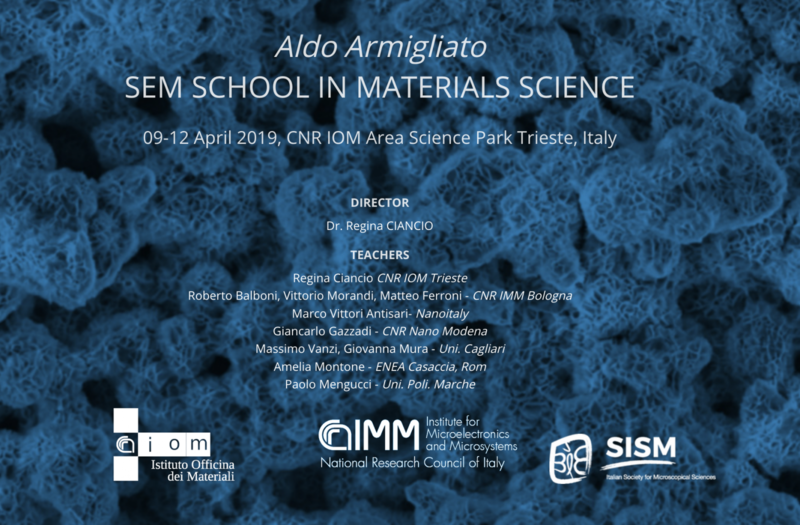 The school, jointly organized by CNR-IOM, CNR-IMM and SISM, is entitled to the memory of Aldo Armigliato, one of the leading Italian electron microscopists who passed away on November 10, 2018. The event will consist of 4 days, the first two dedicated to theoretical lectures, the second two to practical sessions on the SEM-FEG and SEM/FIB of the CNR-IOM and is addressed to researchers, technicians and students both from academia and industry who wish to acquire the skills necessary for the proper use of scanning electron microscopy and related analytical techniques. At the SEM School website (http://semschool.bo.imm.cnr.it/) you can find the final program and all details about venue, registration and special rates accommodation at nearby hotels and guest house. The registration closes on March 15th and a maximum of 24 participants is allowed.